Hooray!! You’re officially engaged, which is one of the most exciting moments of life – and for good reason! After you’ve soaked up your recent engagement, called all of your family and friends to share the happy news, celebrated with your fiancé, and stared at your sparkly ring more than you thought possible… now what? As both a recent bride (we were married on April 1!) and a wedding planner, I know all too well the difficulties and potential stress that can come shortly after the engagement. It’s such an exciting time, but there is a lot that goes into planning a wedding, and I hope that I can help educate and encourage brides-to-be on the next steps, as well as guide you throughout your engagement and beyond! A few big decisions need to be made right away, and quickly. All at once, you need a general idea of the budget, guest list/guest count, a venue, and, of course, a wedding date! For some, opting for a longer engagement is ideal, and for others, the opposite is true. I think every engaged couple should simply relish in their engagement and enjoy this new season of life! We spent many days (weeks?!) drinking celebratory champagne with our family and friends, and we enjoyed every second of these celebrations! But it’s also time to begin thinking about those big details pretty soon after the proposal. These four moving pieces (budget, guest count, venue, and date) are often the foremost items to be checked off the to-do list first. It’s hard to move forward with wedding planning without having a better grasp on these details! Talk with your fiancé about when you would like to get married, whether it’s six months, one year, or two years from now. Know that some flexibility needs to be involved, as well! You also need to talk with your families about the budget, including what you and your fiancé are also willing to contribute to the overall wedding budget. Depending on several factors, you may want to check in with both sets of parents (and possibly your grandparents) to see if they are able to graciously contribute to your wedding. Go into these (sometimes awkward or difficult) conversations with a general sense of what you might be spending overall on the wedding, and, most importantly, grateful hearts for whatever may be given towards your wedding. I wouldn’t advise any engaged couples to explore venues or other big ticket vendors without knowing if they are within any ballpark of the budget, as this can lead to plenty of disappointment! Once you’ve settled on a budget, begin working with your parents to build an initial guest list. Many venues can only accommodate a certain number of guests for a seated reception, so it’s very helpful to know if you will want to invite 80 guests or 150 guests or 300. After getting a better sense of your guest count range, it’s time to settle on a location of your wedding, research those venues, do walk-throughs of the venues you like the most and meet with the venue coordinator, and inquire about availability and pricing. Hopefully things work out well and you’re able to find the perfect venue for your wedding on the date that you want! Rob and I had a general timeline in mind for our wedding, and we also knew we didn’t want a long engagement. 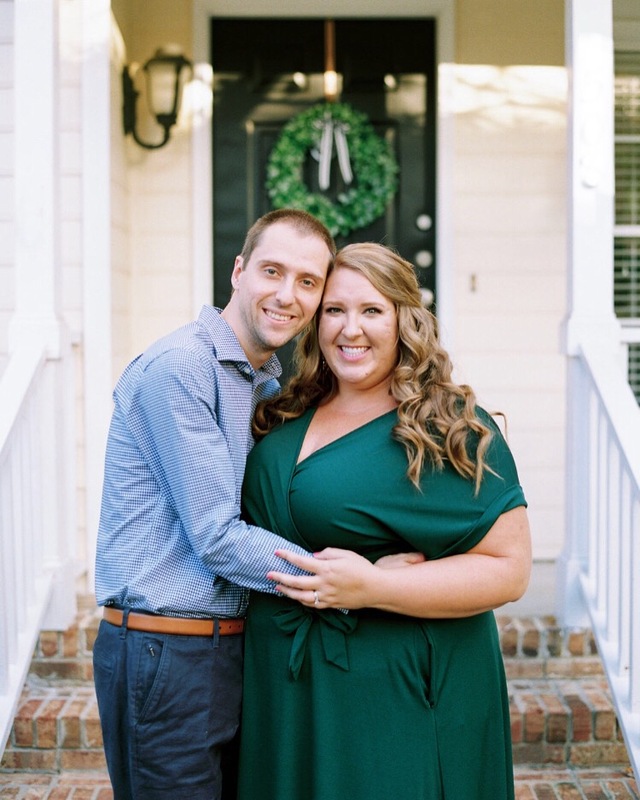 As a wedding planner in Raleigh, I have an excellent grasp on what it takes to plan a wedding, how long I think I need to do so, and I already know a plethora of venues and vendors in the area. Keeping in mind the weddings I already have on my calendar for next year, we were thinking a late summer wedding – or possibly late Spring. All of this, of course, depended on when he proposed! Rob asked me to be his wife on October 1, 2016, and it just so happens that we were married exactly six months later on April 1, 2017 (yes, April Fool’s Day – we’re two fools in love, as he says!). Once we were engaged, we discussed the location and potential venues for our wedding. We easily decided on Raleigh, North Carolina, as it’s our home, and it will be our home together. I went to college just down the road in Chapel Hill, and I moved back to the area (to Raleigh) a little over a year ago. Rob has lived in Raleigh for a while (for undergrad at NC State and working here since he graduated). We also met and fell in love here, so it’s only fitting that we tied the knot in our great city! We inquired about pricing and availability at only a small handful of venues. We knew a few things going into this: our large-ish guest count, the ambiance and aesthetic we desired, the budget we had in mind, and a central location to Raleigh. The Merrimon-Wynne House in downtown Raleigh was our first choice from the very beginning! We quickly heard back from them that they had one available Saturday in a seven month window of time in 2017, which just so happened to be April 1. After mulling it over and talking with our parents, we decided to go for it! Our engagement might have been a smidge shorter than anticipated, but we never once regretted our decision and the wedding venue that we chose. We LOVED our six month engagement, for sure, and I am so glad we had six months to plan versus a year or more. photo by Ally + Bobby + planning by Stephanie Scholl Events – do you recognize anyone here?! Once your wedding date and venue are locked in place, it’s time to select your other wedding vendors! I recommend working on this in a particular order of sorts: you want to prioritize those vendors who book up most quickly, those who are absolute “musts” on your list, and vendors who can only do one weddng per day (like a wedding planner or photographer – we can’t be at two weddings at once!). I think most would agree that securing the photographer of your dreams, as well as your wedding planner, are two of the very first steps after your engagement and before you book the rest of your vendors. (Here is why I firmly believe you’ll never regret investing in a wedding planner, as well as the difference between a wedding planner and a venue coordinator!) Photographers often top a bride and groom’s list of must-have vendors, and wedding planners can also give amazing recommendations and personal opinions on other vendors who would be the best fit for your wedding. I hope you found this helpful and are encouarged by the wedding planning process (and not overwhelmed or anxious!). At the end of the day, what ultimately matters is that you get to marry your fiancé, surrounded by family and friends who love and support you as you begin your marriage! I try to remind my couples, as well as my friends, of this all the time if they start to feel worried or overwhelmed during their engagement. Do you have any questions about the first wedding planning steps to take after your engagement? Please let me know if I can offer more inpur or expertise for you – I want to help and encourage any brides-to-be as much as possible!